Ford called on British firm GKN for its brilliant Focus RS drivetrain. Even more than the engine, it’s the rear axle of the Ford Focus RS that makes it the brilliant car that it is. This electronically controlled piece of torque-vectoring genius makes the fab Ford handle better than any other all-wheel-drive hot hatch. You can really sense it driving the outside rear wheel to sharpen turn-in and quell power-on understeer. It’s also largely responsible for the hilariously smoky effectiveness of the Focus RS’s world-first Drift Mode. Yet it’s not Ford hardware. The rear drive unit of the Focus RS is made by GKN. The global component supplier, with its headquarters in the British Midlands, markets it as the Twinster. The name is a reference to the unit’s pair of independently controlled clutches, which can dole out torque to each rear wheel with incredible speed and absolute precision. 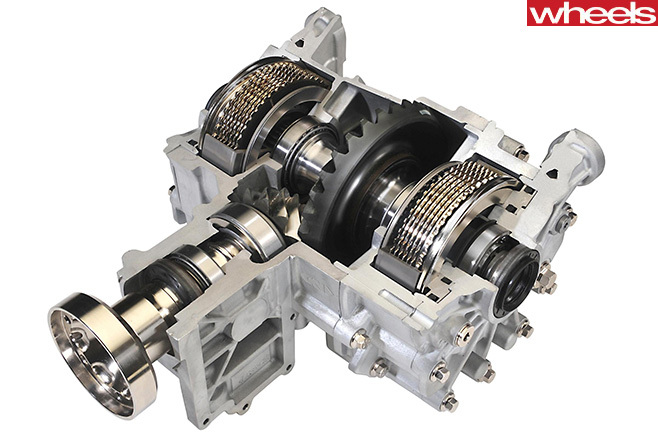 Twinster’s superiority to Haldex-type all-wheel-drive tech, especially in a high-performance application, is massive. The Ford Performance people working on the Focus RS figured this out for themselves. Vehicle engineering manager Tyrone Johnson, who led the development team, recalls obtaining an early Twinster and bolting it into a prototype. Land Rover was the first carmaker to use it, in the 2014 update of the Range Rover Evoque, and that’s what Ford got its hands on. They broke it, Johnson admits, but not before realising it had the potential to make the Focus RS a much better car. GKN engineered a tougher Twinster (pictured top) specifically for the Ford and worked with the carmaker’s engineers to develop and polish the control algorithms for each of the Focus RS’s four driver-selectable driving modes. All in just 18 months. This was a surprise to me, though I was familiar with the name GKN. It was the logo on the waxy paper that wrapped greasy universal joints I bought for British-designed machinery I owned in the ’70s and ’80s (an MG Midget Mk III and a Land Rover 110 County diesel, if you must know). My obviously out-of-date image of GKN was as a maker of simple but failure-prone parts. Developing innovative technologies and working with a carmaker to meet a tight launch deadline simply wasn’t part of the picture. GKN, it turns out, has changed more than a little over the decades. In fact, as I learned, it’s regularly rolling out clever stuff. The list of recent cars featuring GKN hardware is deeply impressive. The electric-powered front axle of the Porsche 918 Spyder, for example, is GKN’s work. It also developed the world-first two-speed transmission for the front axle of the BMW i8, key to the plug-in hybrid’s grunty but 120km/h speed-limited electric-only performance and its ability to deliver electric boost in hybrid mode all the way up to 250km/h. The company also developed a more compact version of the 918’s eAxle to drive the rear wheels of the Volvo XC90 T8 Twin Engine plug-in hybrid. The role of major automotive component makers is easily overlooked. Only a handful are anything like household names. But as the case of GKN shows, there are times when the brilliance of a car is owed as much to some almost anonymous outfit as the company whose name is on its badge. The top five customers for GKN’s automotive wares are VW, Fiat Chrysler, Ford, Nissan Renault and GM. Carmakers are GKN’s biggest income source. Aerospace is the other major area of activity. GKN supplies airframe and engine components to name brands including Airbus, Boeing, GE and Rolls-Royce. The new Ford Focus ST has us excited but also intrigued. Does it have what it takes to beat the established competition?